Do you have Olympic fever? I sure do! My sleep schedule was a mess this past week staying up late to watch the NBC coverage, not to mention getting up for the women's marathon at 3 am today. I find I can't help it, I'm so excited for the athletes accomplishments and love supporting them. I also tend to get chills and teary-eyed for the winners of events I'm attached to. I'm a total run nerd. My favorite events include basically all Track events, plus gymnastics and swimming. I was seriously pumped when Track & Field finally began on Friday with one of my favorite events, the women's 10,000m. This race wasn't televised so I caught it live on NBC streaming; check out the replay if you missed it. Fantastic race and super sprint finish by Ethiopian runner Dibaba for the gold. I've been finding the NBC streaming site to be way better than the TV coverage, which I've pretty much given up on for Track events. The hard part is that you need to login with your cable account information, so no cable equals no streaming. Not cool. Yesterday included the men's 10,000m race - where Galen Rupp took the silver for the US! If you don't know how significant this is, here you go: according to US Track & Field on Twitter, it was the first US medal in the 10K since 1964, and only the third medal in this event ever. Impressed yet? Rupp is an amazing distance runner and he ran the race so well. I was on the edge of my seat the whole time. 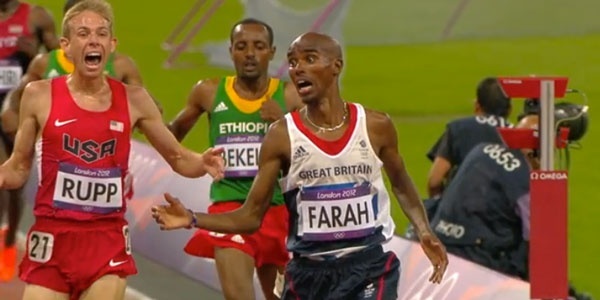 Even better, check out this photo montage on the Flotrack site to see the documented happiness of the winners Mo Farah (gold) and Galen Rupp (silver) at the end of the race. They are training partners in Oregon with Alberto Salazar - what a day for him as a coach! One of my most awaited events, the women's marathon, took place very early Pacific time this morning. I know it's a little crazy to get up at 3 am for the Olympics, but some races I just want to see in real time. I've been a big fan of Kara Goucher for years, and of course I was rooting for Shalane Flanagan and Desi Davila too. Unfortunately, Desi was out early in the race due to an injury she's been fighting. Both Kara and Shalane held with the lead pack for a long time, until a little after the half point. Even though they dropped back, they finished 10th (Shalane) and 11th (Kara) in the end. These ladies are so inspirational to me, running so hard and fast in the Olympics and rocking it. Watching them run makes me want to run even more than I already do. Next weekend, we get to watch the men compete in the marathon at another early time. I think I'll be getting up again. Will you? Did you watch the women's race this time? Happy continued Olympics week everyone - enjoy and be inspired! I can totally relate with you!!! I have been completely sleep deprived since the Olympics have started. It's so funny that you posted this because I just wrote about hitting a wall today due to lack of sleep (not only from being on the go, but also because of Olympic fever: runladylike.com/?p=418. I hope you start to get some Zzzzzs. So glad track and field is here! I get up really early anyway, so it's not a big deal. Woke up at about 4:40 this am, turned on the tv and watched the last 10 miles of the race. I expect I'll do the same for the men's marathon. It did give me a late start on my own run, which is tough because it's already about 90 degrees by 6 am. I have no cable, which means no tv and no streaming! While I feel somewhat out of touch, it also doesn't really phase me and I don't feel like I'm missing out on much. Sad about women's marathon today though - really wanted Desi to do well! I have missed almost all of the Olympics because the schedule isn't working well with my daughter's schedule! blah! I almost got up at 3am to see the marathon. Actually, I went to sleep around midnight, told myself "if you wake up at 3, you can watch" which was a big mistake because of course I woke up. But then I knew I was going to do a long run myself so I wanted to go back to sleep. I kept thinking about the marathon so I ended up following it on twitter from bed! HA! Oh my. I guess I should consider myself lucky to live on the east coast right now. So my 630 am normal wake up (take the dogs out) allowed me to see the race from like mile 8 onward! No 3 am around here. I'm totally addicted too! I feel like I haven't slept at all. Maybe watching more and more track and field events and running events will help me get my motivation back:) I was really sad about Desi too. I hope she's okay. The look on their faces says it all. Great post and YES, I'll be up.